A gaffe of mine at Borough Council last night. Apart from that, it went well. Can’t believe that it has been two weeks since I last posted. Did have a period of being unwell but since than have started deliverying in Feltham West. Any residents from there, please feel free to say what you thought of the leaflet. Up early in the morning? I am and will be on Sunrise TV at around 7am. Sky Digital 830. I am reviewing the papers! Posted in Uncategorized | Comments Off on Up early in the morning? John Randall (against expansion) and David Wilshire (for) gave excellent speeches – and Labour MPs Fiona Mactaggart, Chris Mullin, Martin Salter, John McDonnell all made very effective contributions against expansion. An excellent contribution from him, with exception of his response to Geoff Hoon’s intervention – which seemed odd and incomplete. But I do not want to take away from him, what was an effective speech. What I particularly liked about his speech was his heavier focus on mixed mode than on the 3rd runway. There is genuinely hardly any difference at all between Alan Keen and I on Heathrow. With a few exceptions, I was rather accurate. It is fascinating how polarised America is. Take a look at this CNN resource. GOP clearly do better in rural areas and the Democrats in Cities (and increasingly suburban areas). One of the most important thing that politicians must do in their career – in my view – is be gracious if they encounter defeat. I loved McCain’s speech. Congrats to Obama – an excellent campaign from a very intelligent man! Posted in Uncategorized | Comments Off on Not too far away! I make that 336 Electoral College Votes for the Democrats! Hope I am wrong but pretty confident about this. Note I am suggesting that Pennsylvania will buck the trend a little. We have a dinner every year to pay tribute to Admiral Nelson! 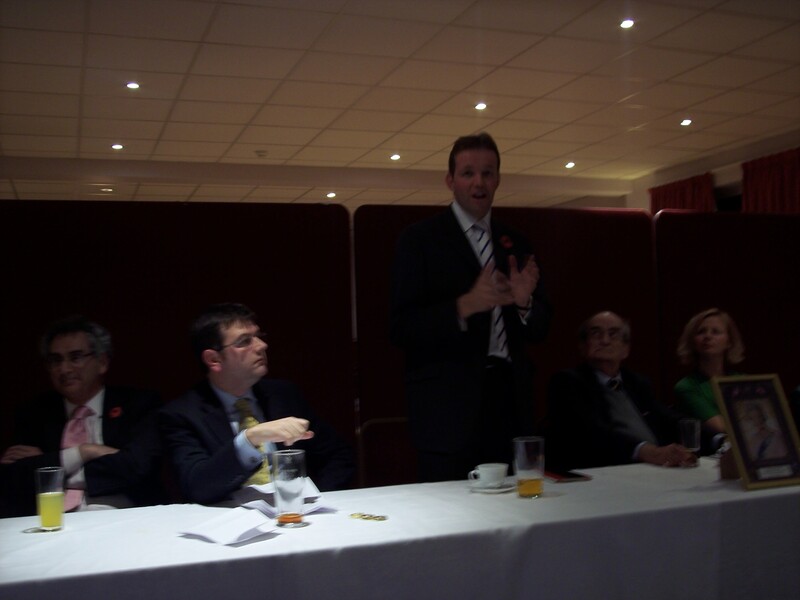 David Burrowes MP was our Guest Speaker at the most recent dinner and what a pleasure it was. As I said, during my Vote of Thanks, I regularly plug the fact that I achieved an 8.4% swing last time. Well, he achieved an 8.7% swing at the same election and was elected. Naturally, I asked him for some tips on how it is done! From left to right: Tony Arbour (Local Assembly member), Me, David Burrowes MP, Tony Viney (Feltham & Heston Association Chairman) and Mrs Burrowes.